Multilocation businesses often have store locators, but many aren't making the most of them. Columnist Adam Dorfman suggests ways to optimize your locator to provide a better user experience and increase conversions. How often do you review your store or professional locator to make sure it is up to date and optimized to convert on the KPIs that matter most? After all, anyone who is visiting your locator is already interested in your brand. Your job is to use your locator to turn that consumer intent into a purchase or lead, as successful online shopping carts do. If you learn one lesson from this article, it should be this: the goal of your locators is to create revenue for your business, not simply to drive traffic to your location pages. Your business locators should not exist solely to enable people to visit your brick-and-mortar storefronts by providing accurate location data. Your business locators should also encourage people to spend money at your locations. I’m surprised at how many major brands fail to make it easy for consumers to not only find their brick-and-mortar locations from their locators, but to encourage them to take actions when they are there. For instance, let’s compare the store locators for two major brands: Mercedes-Benz and Sephora. 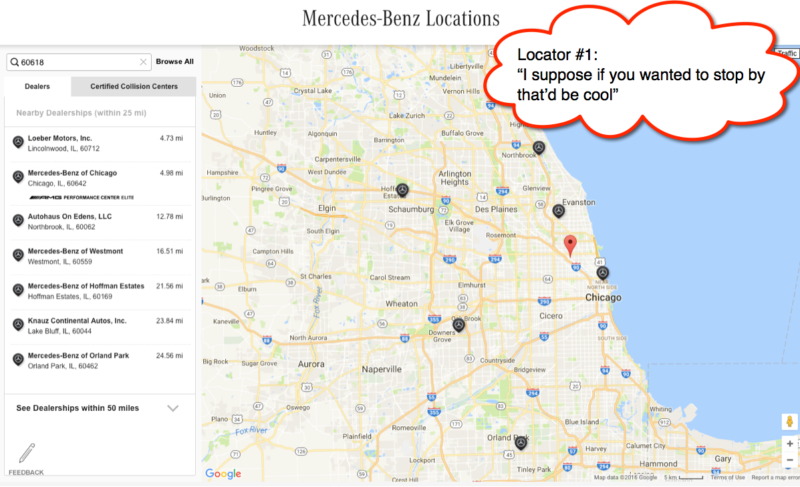 The Mercedes-Benz website provides a poor user interface with minimal information about its stores and no ability to adjust the location range. Calls to action are only visible once you click on a location. How about your store locators? Are you creating stumbling blocks to in-store sales or encouraging people to visit? With the rise of the mobile consumer, and with most search queries come from mobile devices, it is imperative that your store locator is optimized for mobile. ATI Physical Therapy, a national organization with more than 600 locations, does so. ATI created a useful experience with the mobile user in mind once they realized how many of its customers look for locations while on mobile devices, as opposed to desktops and laptops. Consequently, ATI’s locator user experience is adjusted based on device type. Compare ATI to one of its largest competitors, Athletico, and it is easy to see what a difference mobile optimization can make on locators. Having location detection and autocomplete functionality on your business locator may sound technical frills, but these features are crucial to providing a great user experience. The last thing you want people to do when they get to your site is to be unable to find the location nearest to them — a problem that can happen easily with one simple typo on a standard locator search. There are two ways to avoid this stumbling block. The first is to leverage location detection technology so that you serve up the most appropriate location for your visitors without their having to ask for it. The second is to use autocomplete functionality on your locator to ensure that users are likely to enter a query that will return relevant results. Successful hospitals treat their websites like digital front doors, or as jumping-off points for patient discovery. They make it as easy to find providers as finding a local Starbucks by creating a foundation with location data and enriching that data with contextual content such as a provider’s personal mission statement and patient ratings/reviews. Doing so ensures that patients are more likely to find the care they need. Sometimes the right strategy is to offer useful information that people might not be looking for simply because they are unaware of it, as Sephora does by serving up information about in-store events and sales in its locators. I recommend that businesses develop a location data management strategy that treats data as an asset, combined with contextual content to attract visitors. While location attributes continue to rise in importance, you don’t need to create a locator filter for every one you have data on. Providing useful filters is the key to helping consumers find the most relevant content they need. Banks sometimes encounter this problem when they cram their ATM locators with all kinds of information about available services for consumers who simply want to find an ATM. Pharmacies and retail stores also struggle sometimes by surfacing all possible data about their locations instead of displaying the most important attributes, such as the availability of 24-hour drive-through. Starbucks provides a best-in-class example of filtering your data by providing layers of detail about its locations depending on what a consumer needs to know. Multiple locators are sometimes necessary when your business offers a complex set of products and services with different targeted audiences. Healthcare systems, for instance, would not want to include a locator that lists every hospital, clinic, facility or service on a page about their urgent care center. Instead, a scaled-back locator that only includes results of urgent care centers near the searcher makes the most sense, so that the patient in need of care doesn’t have to filter through results themselves. Due to the rise of sites like Yelp and TripAdvisor, and with Google making reviews more prominent than ever in its search results pages, consumers have been conditioned to expect ratings in their search results. As you can see below, hotel brands are starting to embrace this idea, with Marriott prominently displaying ratings in its locator search results. I recommend that businesses not treat reviews with trepidation but instead celebrate them. Professional services companies — such as medical practices, legal offices and accountants — have special needs that need to be considered. For instance, doctors, attorneys and accountants may share a single location, which needs to be accounted for in a directory to avoid confusing people looking for radically different services that happen to exist under one roof. Moreover, these professionals often operate out of multiple locations, and your locator tool needs to account for the subtle but important differences such as their addresses, hours of operation and services offered for different days of the week. Don’t make your customers work too hard to find what they need. Be mindful not to clutter your locator with excessive detail. A good litmus test to apply is this: ask whether the content and design elements contribute to a customer conversion. Although Marriott does a good job sharing customer reviews, the brand is guilty of information overload by sharing details that its customers are less likely to find interesting and useful. On the other hand, Klimpton Hotels offers a super-clean design and only the information you really need to find a location. Your locator needs to change along with consumer behavior and technology. Klimpton does a great job tinkering with its hotel locators, modifying its design and offering different search results depending on whether you’re taking a tour of its locations or booking a room. Test new functions with your customers (e.g., do you want to add “ride there with Lyft/Uber” functionality to your locator pages?) and update accordingly. The key to making your locators useful in this post-digital era of omnichannel search is to first understand your customers’ journeys, from awareness of your brand to in-store sales, and then create a strategy that combines data, contextual content and a compelling user experience. Your locators are perfectly positioned to do this and will make location marketing more valuable to your brand.